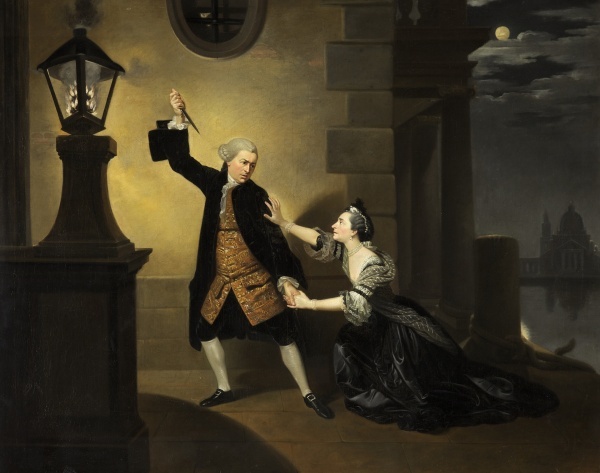 David Garrick as Jaffier and Susannah Cibber as Belvidera in "Venice Preserved"
Against a moonlit view of Venice, a husband raises his dagger to kill his wife. In the 1762 production of Thomas Otway’s tragedy, the hero Jaffier was played by David Garrick and his wife by Susannah Cibber (1714-1776), one of the ablest singers and actresses of her time. The scene is one of great drama with the despairing Jaffier torn between the love of his wife and his loyalty towards his best friend whom she has made him betray.